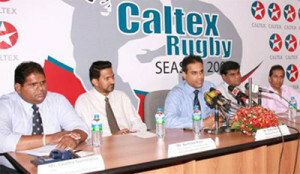 A decade of Rugby sponsorship by Caltex | Welcome to Chevron Lubricant Lanka PLC. Chevron Lubricants Lanka PLC marketers of Caltex branded lubricants marked a decade in their sponsorship of the Caltex ‘A’ Division League and the Caltex knockout tournaments by committing to sponsor this year’s tournaments as well. At a ceremony held at the Sri Lanka Rugby Football Union, Chevron Lubricants Lanka PLC pledged their commitment to the SLRFU, for another year running, celebrating ten years in this fruitful partnership in support of Sri Lanka rugby. In 2000, Caltex began its partnership with the Sri Lanka Rugby Football Union (SLRFU) in support of the two tournaments. “Sponsorship for us has indeed been rewarding. Over the last nine years we have seen the game of rugby grow and develop adding value to both the sport and in turn to the organization by complementing our brand personality of Power, Energy and speed” says Mr. Kishu Gomes. The 2009 Caltex "A" division League will kick off when CH & FC hosts the Police SC on 15 May at Maitland Crescent while on the same day Kandy SC will take on the Sailors at Welisara. There will be a total of 8 teams completing in the A Division for this year which includes the Navy SC team who have rejoined the ‘A’ division league after a lapse of 3 years. With these changes Chevron Lubricants Lanka PLC feels confident that the competitiveness of the tournament can be elevated to a higher level this season. As per the Sri Lanka Rugby Football Union, the tournament structure for the 2009 season will remain unchanged. However the SLRFU officials will introduce additional rules and regulations into the tournament that will further help to enhance the competitiveness of the game. Similar to previous years, Chevron Lubricants Lanka PLC will continue to promote the game further through a number of initiatives such as distribution of season fixture cards, club co-branded merchandise sales and street and media campaigns. Key matches of the tournament will be given live TV coverage. Despite the economic downturn in the Sri Lankan economy, Chevron Lubricants Lanka PLC is confident that the 2009 season will be equally successful and exciting as in the past. “Although the country is facing a difficult time, and the Sri Lankan economy is plummeting, we have ensured the SLRFU of our continued sponsorship through 2009 of the A Division league and knockout tournaments” says Mr. Kishu Gomes, Managing Director / CEO – Chevron Lubricants Lanka PLC. “However, with signs of permanent peace on the horizon, we feel confident that the economy will pick up and thus we do not see any reason to withhold our sponsorship of rugby for this year”. Chevron Lanka Lubricants PLC is the official sponsors of the Caltex ‘A” Division League and the Caltex Clifford Cup Knockout tournaments up to 2010. Over the year’s organization has been pleased with the momentum the sport has gathered. Mr. Gomes said “In the past the SLRFU has been able to rally everyone around them to achieve the desired results. We are confident of the same commitment from the officials of the SLRFU in 2009 as well."